> Thank you for your swift and positive response to my mail. This goes a long way to show that you are a serious minded person, which is what this transaction is all about.Now, we have come to a stage in this international business where we have no other choice than to proceed further on it without looking back. > I am not trying to deceive you or to do anything that will harm your image nor my own image as a renowned lawyer and human right activist,this is a mutual relationship that you will benefit a lot from. > The money is presently in bank waiting to be transferred to any bank account of your choice. If you are really interested in this transaction, I attach an application form to this message which you are to fill in your personal details and return back to me to crosscheck it before it will be officially forwarded to the bank for formal approval prior to release of the funds in your favour. I will also employ the service of a Senior Advocate who will help us in procuring the entire necessary documents that will authenticate the claim since i have retired from active legal service after my late client death. > So, all I have to do after you fill the form and return it back to me is to direct you to the bank as the beneficiary of the funds. With my position in the transaction as personal attorney to the original fund depositor my late client, and assistance by the senior advocate whom i will employ,there is every guarantee that your application will be given prompt attention and every verification/processment made within a week so that the transfer will be effected soon. > Don't be afraid of anything as the transaction is 100% risk-free.I have worked out all the modalities all these years. It is your turn now to apply for the release of the fund. I assure you that I am capable of giving you solution or information to whatever requirement the bank may need for the release of the fund within 7 working days from now pending your level of your punctuality and corporation to me. > Note: On no circumstances should you let the bank know of my involvement in this transaction. I will be working in the background with assistance from th senior advocate whom i will employ, he will sure that the fund is approved in your favour. 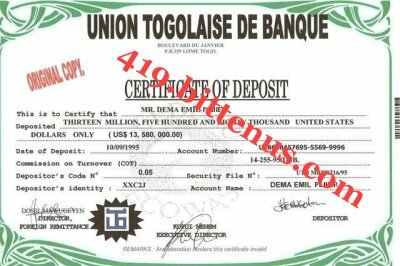 Once this is done and the fund transferred in any of your nominated bank account, I will fly over to your country to share the fund with you in 50/50% ratio after check and balance and consequently open a business there, of course with your help. I will like to have a partnership with you in any business venture I may operate in your country as I am going to be a new person who does not know how things are being run there. > With this understanding ,you can agree with me that it will be a great pleasure transacting this international business as one partner and that we are up for a serious business transaction ok? 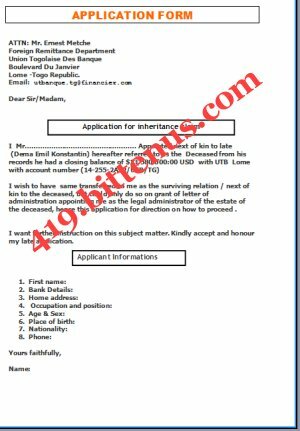 > As soon as I receive back the filled form from you,I will furnish you with the detail contact information of the bank and go ahead to contact the Senior Advocate for the commencement of the paper work that will authenticate our claim should in case the executing bank management demands for it. Mind you that this is a legitimate international monetary transfer arrangement that requires good and proper legitimacy to carry out successful in a way the guiding law will not be breached not disrespected ok? > Kindly follow above directives and get back to me on time so that you will not slow transfer procedure.And remain blessed till i hear back from you. > Expecting your speedy response as we hope for the best.Good luck! > Email received.Foremost,i appreciate your carefulness ion this international business showing your serious mindedness which is al i need in this transaction as a matter of fact. > However,i disagree with you over your statement concerning my business proposal because happenings in the world will not affect our legitimate business if you will agree with me. > I swear to you as a legal practitioner under oath that that i brought this business to you with aim of establishing a strong business relationship and empire with you if only you can grant me your support and corporation. > I attach my International Passport and my Call-to-Bar Authorization license and other relevant documents to you for you to see me and know that we are not joking neither is this a child's play ok?I am a renowned attorney in my country as a human right activist who speaks for the sake of the poor masses and in many occasions i have been arrested by our government for my fight against human right violation because i believe whatsoever you do in this world you will also reap it return. 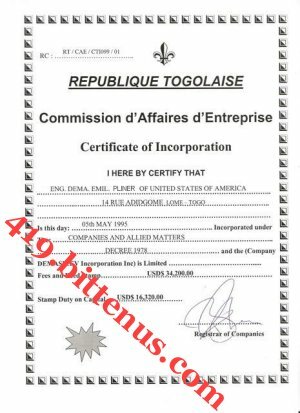 > Please do not count nor relate this business with what you see i the internet as that will only bring distraction in you.There are many things on internet but it is also a communication means which prompt me to contact you though it ok?I came to you to build and not to distroy because i am a contesting candidate in the forthcoming Togolese bar association presidency meaning that i will not do anything nor involve in any business that will damage my ambition and the name of my family. > This is a legitimate business,i am the personal attorney to my late client who has no living next of kin and according to inheritance law,i have every fundamental right to present a next of kin/heir to inherit his asset without any interuption from any source ok?Let us not begin to count on worldly events because there still legitimate business going on around the world if you will agree with me. > Finally,with this understanding we can start this business and know who is who as we proceed.Just grant me your little corporation and see if am lying or not.You cannot just conclude when we are about to start as you are not God ok? > Let me have your positive response so that we can continue in this profitable business for good.